Abbot Girolamo Tiraboschi writes in this way about Emanuele Tesauro (Second Part – Volume VII) in his Storia della Letteratura Italiana del Cavaliere Abate Girolamo Tiraboschi, Consigliere di S. A.S. Il Signor Duca di Modena, dall’Anno MDC all’ Anno MDCC (History of the Italian Literature of Cavalier Abate Girolamo Tiraboschi, Counsellor of H. S. M. Lord Duke of Modena from the year MDC to the year MDCC) printed in Modena in 1793. 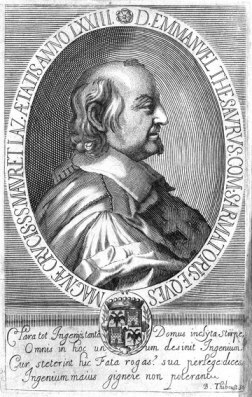 “Count Emanuele Tesauro, a noble from Turin and a Knight of the great Cross of the Order of Saints Mauritius and Lazarus, in mid-century wrote many works on various subjects; he published in Turin, 1654, Il Regno d’Italia sotto i Barbari (The Italian Kingdom under the barbarians), a work in which, as in all the others, it is possible to see an author with a lively mind, who could have had an honourable place in the Republic of Letters if he had not been given to the prejudices of his century”. Tesauro, a literary figure and historiographer, was born in Turin in 1592 and died in the same city in 1675. He entered the Jesuit Order in 1611. He wrote historical works, among which were the Campeggiamenti di Fiandre (Campaigns in Flanders) (1646) and the summarial Italian Kingdom under the Barbarians (1654). In the same year he composed the Cannocchiale Aristotelico (TheAristotelian Telescope), the most important essay of baroque rhetoric, in which the author highlights and defines clearly the relationship between the forms privileged by the literati and the innovative tendencies that the transforming world was imposing upon to the mentality of the 1600s. (Extensive discussion of this work in an essayin the Italian version) (1). The expression "Aristotelian Telescope" is an oxymoron, a rhetorical figure that consists in bringing together two terms in strong antithesis: in this case classical Aristotlelian philosophy and modern science. While the Aristotlelian philosophy – for which everything has its place in a system, and which uses the deductive system (by reference to a general statement the particular is explained) - Galilean science, symbolized by the Telescope, uses the inductive method, which is to say, observing the particular leads to the enunciation of a general theory. In this case the oxymoron had the function of bringing the two divergent aspects nearer, giving an acceptable dress to the methods of reasoning founded upon metaphor, which for the author represents the rhetorical figure par excellence, as capable of connecting distant phenomena through basic analogy. The complete title is Cannocchiale Aristotelico, o sia Idea dell'Arguta et Ingeniosa Elocutione che serve à tutta l'Arte Oratoria, Lapidaria, et Simbolica esaminata co’ Principij del divino Aristotile (Aristotelian Telescope or Idea of the Witty and Ingenious Locution that serves all Oratory, Lapidary and Symbolic Art examined with the Principles of the divine Aristotle). Here we report, from the edition printed in Turin in 1670 (by Bartolomeo Zavatta), the passage in which the author, talking of the “Composed Symbols” of the “Mute” kind in Chapter II, dedicated to “Instrumental Causes of Witticisms”, introduces the symbols of Tarot and Chess. The close examination of Chess is reported because, according to new charming discoveries by Lothar Teikemeier. tarot might have been born from an elaboration of the latter game. A close examination of the Aristotelian telesceope has been made in a specific essay in Italian. “Finally from the same origin proceeds what is agreeable and ingenious in MUTE GAMES, representing some heroic subjects. Such is the game of Tarot, a worthy concept of barbarian genius, where you see every person of the world becoming shuffled and mixed, each with his own emblem: The Rich with Money, Drunkards with Cups, Warriors with Swords, Shepherds with Staves. Emperors, Prelates, Angels, Demons: it is as though the player grasping a bunch of cards in his hand had the world in his fist: & playing, metaphorically, is none other than putting the universe into confusion; & the one who ruins it the most is the winner. But the most heroic and witty game, even a school of war, is Chess, where in a small battlefield are two armies, one of White Assyrians, the other of Black African Moors: & here there are Kings, Queens, Soldiers, Knights, Towered Elephants; and Infantrymen: at the sign of the two players, as War Masters, facing, assaulting, liyng in wait, surprising, running, helping, hurting, covering, imprisoning, leaving the world: finally after defeating the adversary's army & imprisoning its King (the only one whose life is preserved) there is a difficult but sweet victory, a conflict with no blood, but not without the loser’s anger. A game in fact born from the warrior intellect of Palamedes among the Greek tents, in order to fight against idleness, so you must not be surprised, if from Zeus's brain was born armed Pallas, since from a soldier’s brain is born armies. So what is this game, but a heroic symbol, a continuous metaphor? These little images animated by a living hand allegorically represent the conflict of wits; for the Witticism they have the moves So the player is transfigured into the personalities represented by wooden soldiers: & in our images lives the player’s mind" (2). Tarot and Chess therefore, according to the author, belong to Heroic Subjects; they are Mute symbols (images of words) and are Composed. The author writes about Composed Symbols: “In the COMPOSED WITTICISM are confounded two or more simple witticisms…; in this way the Witticism that is nothing but a poetical Imitation, mixing the MUTE and TALKING methods, & from these or between these, gives birth to a numerous variety of attractive Symbols; many of them even today are known more by sight than by their true names as appraised by the literati” (page 39). 1 - Please, see in Italian the essay Il Cannocchiale Aristotelico. 2 - The belief that Chess had been invented by Palamedes under the walls of Troy was still alive in the XVII century.